Marching ahead | the future is today! We are officially in the Digital age where smartphone usage is more than laptop or desktop utilization. The % of people shopping through their phones continues to increase. A third of the world’s population interacts through social media portals (Facebook, Google+, Instagram, Twitter etc.) And it is estimated that that CMOs spent $135 billion USD(1) on digital marketing last year. While digital transformation drove a lot of new trends in supply chain as executives started to think about collaboration, analytics and a consumer centric supply chain, many could not figure out a path forward. 2015 and the next couple of years are going to be hot for supply chain. So fasten your seat belt and start thinking about how YOU will transform your supply chain. 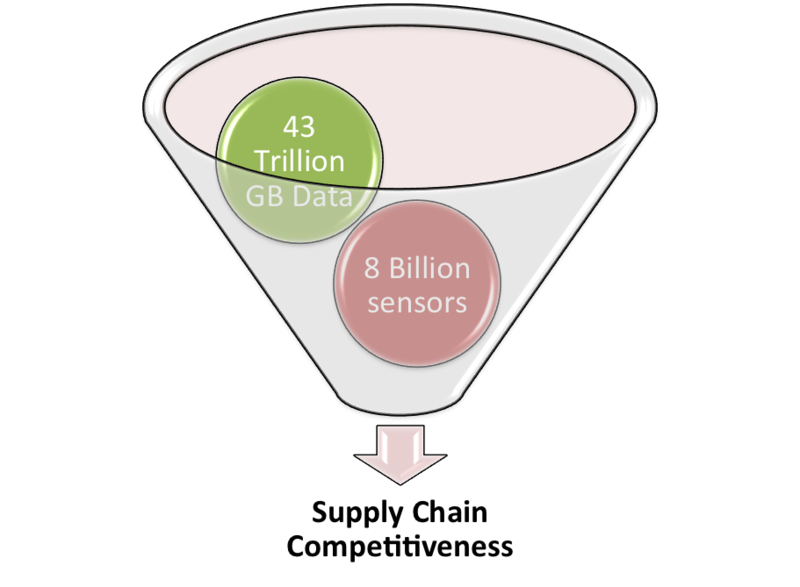 Top analysts like Gartner predict that there will be 43 trillion GB of data by 2020 and 8 billion sensors(2) will be operational. We are seeing the industry gearing for Internet of Things and 3D printing, both of which will generate even more data. CMOs will continue to invest in customer engagement. Supply chain executives need to think about how will they integrate better with customer facing digitization, and what a new supply chain that could leverage all this data would look like. Supply Chain analytics will become critical to create competitive advantage. Companies would need to develop multiple supply chains to align with their customer segments and one size fits all won’t work any more. The key would be to create an agile supply chain that operates on early sensing based on consumer data and can respond quickly without increasing operating cost. While analytics will help improve the bottom line, supply chain could get a seat on the table by improving revenue with offerings like co-innovation with customers and better integration with front end customer segmentation. A good example would be from Retail and CPG where companies are trying to allure customers with new promotions tailored specifically to a region and sometimes even zip codes. We have seen that today’s customers not only look for better price but they want timely delivery of goods and services with quality. So if you would have worked with your marketing team, you would be able to re-organize your network and inventory position to match those promotions in a cost effective way while delivering on price, time and quality. Although it might sound like you do it already, I would bet No! Key is how quickly can you re-organize for the next promotion while maintaining competitiveness and leadership in consumer demand. This is just one use case amongst hundreds but all predicated on Analytics and Collaboration. How do you drive collaboration? Supply chain executives would need to change the traditional metrics model and align operations with two goals – customer value and shareholder value. These are also the primary goals of any organization but when you look within your supply chains, you will find that cost is the primary driver and metrics are built around that. So establish a cross-functional group comprising of plan, source, make and deliver experts along with some data scientists to develop use cases that would align the supply chain with the two goals. And have this group work closely with marketing and R&D teams so that they can identify early and better ways to collaborate with suppliers and manufacturer. You will be surprised to see the outcome of such a think tank. And most importantly, make sure there is executive support without which such initiatives don’t deliver value. One concern that comes up all the time is the lack of technology to support all these changes. My short response to it – get over it and get your CIO in your next meeting. Technology should not be a barrier any more. ERP leaders like SAP, Oracle and JDA have made huge investments to bring new innovations to the market, and there are hundreds of specialized niche firms offering world-class services with new technologies and innovations. I understand the initial investment but if you rationalize your ROI with the two goals I listed earlier, you will find a better business case (rather than cost savings only based on business case). Now let’s quickly look into some of the industry specific trends that you should focus on. Retail – Omnichannel. Last year retailers figured out a recipe to combat e-commerce but are not necessarily doing it right. Most are still working on operationalizing it. So your 2015 focus should be on how to do omni-channel right such that you can increase shareholder value while maintaining customer value. Manufacturing – beware of 3D printing. Naysayers believe it will not have material impact but most tech companies are launching commercial and home-use 3D printers in 2015-16. Rather than fighting it, embrace it and see what products can move to 3d printing and create a new service model for you. And continue to focus on co-innovation with customers and business partners. Life Sciences – what a year 2014 was with all the acquisitions. While you are focusing on patient safety and traceability, look at managing the supply chain assets as part of your M&A. Supply chain optimization should be a focus for executives to drive a safe and efficient supply chain. Consumer products – just like the retailers, you are facing a stiff competition with e-commerce, rising imported product, razor thin margins and startups. What this industry had started few years ago and most companies did not do it right, should be back in focus – demand driven supply networks. And add social media insights to it. Drive analytics deep into the organization and restructure your supply chain. I am excited about 2015 and the next few years. There should be a lot of innovation with the changes in supply chain. Here is my podcast with SAPInsider on this topic and I hope to connect with many of you at the SCM Conference in Las Vegas on March 30, 2015 (3). You, the consumer, are at the center of a disruptive digital revolution that is being led by technology. It started with social media (Facebook, Twitter, Pinterest etc. ), got charged by mobility and smartphones (Mobile apps), and now awaits the next frontier with Internet of Things, 3D printing, wearable techs and sharing economy. Over the years consumer electronics have become digital instead of mechanical. Cars have microchips controlling their engines, refrigerators have digital inverters, TVs are just another computer, air conditioners have chips, and so on so forth. Any digital device like a chip is capable of storing a software program that controls the device and potentially data like user preference, factory settings etc. Think of these devices as microcomputers like your laptop or desktop. Most recently, technology has sky rocketed with smartphones and smart devices that have a lot more capability and logic. To put things in perspective, just like you send an email, post something on Facebook or Twitter, these devices are capable of transmitting information. If we were to read all such transmissions and let the devices interact with each other in a digital space, we have an “Internet of Things” . Whether you realize it or not, you are living in the Internet of Things. Check for yourself how many of the following questions you answer with ‘Yes’. I have posted mine below. The more Yes’ you have, the more you are a part of IoT. No, because corporates all over the world are now trying to leverage the information to provide better services and products that are tailored to your lifestyle. Gone will be the days where everyone had to buy what companies sold. IoT is forcing companies to learn about you, your habits, likes and dislikes, and in turn offer a personalized experience. Consumer is King (or Queen) again! Yes, it is scary because it exposes your personal life and information to companies who may become overly aggressive in their targeted advertising. It also increases the risk of being hacked since Internet of Things is part of cyberspace just like computers and servers. Hackers can take control of these devices and plan new crimes. Although, there is a strong push already amongst big corporates to ensure IoT security is not undermined, your responsibility when buying such devices is to ask the seller about security standards and protocols. Overall I am excited that the world is changing as we speak. All the futuristic movies we have seen and the cool concepts they imagined, a lot of those concepts will be “live” in our lifetime (next 2-3 decades). Driverless cars from Google, Drones from Amazon, smart watches, flurry of wearable techs and more will continue to redefine user experience. While convenience and wow factors are feeding the innovation, implications for improving human life are tremendous. Medical devices that can alert doctors, smart algorithms that can predict diseases like cancer, AIDS etc, machines/pods that can reach out to the remotest areas, smart channels to improve irrigation, devices that can predict and lower pollution levels, technology to increase arable land, devices that could function as human organs…the possibilities are truly limitless. Our predecessors witnessed the Industrial Revolution in the 19th century. It changed the world forever. We are blessed to be witnessing a Digital Revolution which will change the world as we know today. Good things always come with some Bad things. So will be the case with IoT. People will hack, people will develop new weapons of destruction, digital crimes may increase. However, it will once again come down to human responsibility to make the best use of Internet of Things. While governments and global authorities will have to define new rules and new norms, corporate responsibility will increase to ensure safety of consumer and society. But a lot will depend on You – how well you embrace the change, how well you will use it and how socially responsible you will be! 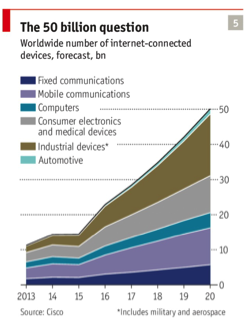 Welcome to the new world of Internet of Things! A few weeks ago I had one of my best weeks in a long time. I met with some very smart and successful people from various levels and backgrounds. We were all assigned a mission so close to impossible that, to make it happen, simple out of the box thinking wasn’t going to be enough. One evening I realized that as we much as we were discussing change for other parts of the organization, it had already begun for the people in the room. And while this team was suppose to change the face of the organization there were mixed feelings when the change was about them. It’s about ME factor – We can act as change champions for others but when it comes to ourselves, we get alerted and have to examine it thoroughly. Lot of questions loom over our head – how difficult will my life and my job become? What will it mean in the future? Will I have the same leverage as today? What about my personal brand? These questions become the first obstacle in why people resist change. Social impact factor – almost all companies have departments, functional teams and informal circles. 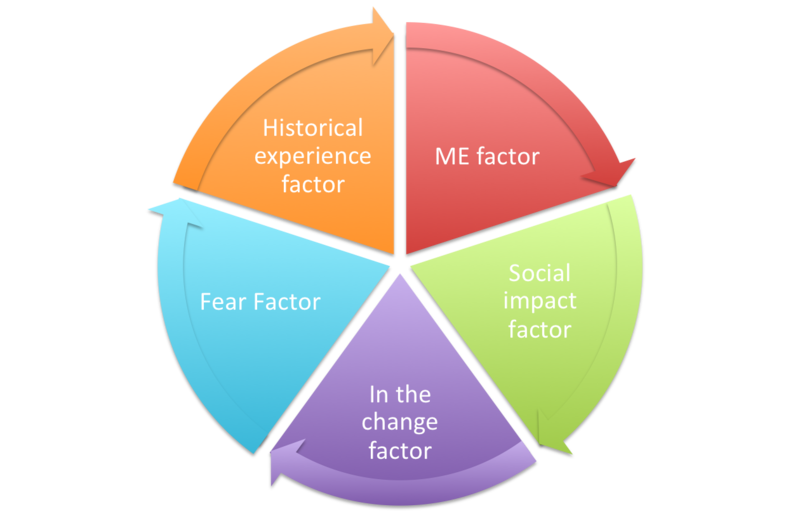 Once people get past the “Me factor”, next up is their group. How will the change impact the role of their group? Will their power and/or position get diluted? What will be the new office dynamics? This is the social thinking in which people tend to extend their reservations to others, mostly in a negative way. It becomes a further barrier due to group effect. “In the change” factor – people who are selected to drive the change (change agents) go through their own set of questions first. What will be our role in executing the change? How painful will it be? How will we be measured? What if the change is not successful? Is it really worth it? Will this propel our careers? People have second thoughts on going through the process because you generally don’t make a lot of friends when initiating change at a massive scale. Primarily it’s a personal risk-reward analysis. Fear factor – fear is the biggest thing in our lives. 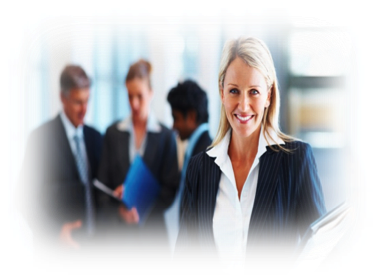 In large companies it plays a prominent role due to organization structure, bureaucracy and culture. What are the executives thinking about the change? Are they withholding some information? Can we keep everyone happy in the process? What if we burn some relationships in the process? This fear is primarily in the extended relationships that generally hang by a thin thread and people don’t want to let them go. The historical experience factor – one of the strongest emotion people have is – that’s how we have been doing it, and have done it successfully. We all live in the glorious past and have successes that we want to extend into the future. We should. However people are not able to make the leap from the past to the new challenge that would require a significant shake up. A radical change often required radical thinking and transformation of ideas, people, processes and technology. While past successes can be leveraged, they are never enough. As we met the last day, I looked at everyone in the room. It was interesting to see people in various stages of change cycle and which factor(s) were influencing them. The change had already begun without people realizing that they were in it. I was in it too! Heartbleed bug seems to pose a bigger threat than nuclear weapons as it can paralyze the internet we know. Hackers went straight to the heart of internet security – Open SSL – and opened it for other hackers worldwide. So, as you check your bank accounts, do internet shopping or execute other secure transactions, watch out for the warnings or change your passwords. Motorola is selling another one of its division to Zebra technologies. Zebra, well known for its industrial devices like thermal printers, will become the largest player in the industrial device industry. Good for Zebra but the legacy of Motorola seems to be dying every year. Nigeria has become Africa’s biggest economy with their adjustment to GDP, surpassing South Africa. With a $500b+ GDP, this seems good only on paper as more than 70% of the population still lives on $2 or less a day. At the same time it may attract foreign investors to shell more money to drive development in the country. SAP announced a new supply chain solution at the SAPInsider – Supply Chain Control Tower. While it’s competitors have similar offerings, SC control tower brings advanced and truly integrated capabilities to adjust strategic and tactical business plans in real time to assess cash flow, service level and profitability impact. Powered by Hana. Drone wars continue as Google is buying New Mexico based firm Titan Aerospace. Titan claims to have small and big drones, some of which can be put to commercial use by 2015. With Amazon already ahead, Facebook has also acquired a UK based firm. Race is on but watch out for the skies above you. You may soon see drone advertisements! In the last couple of years, I have had the opportunity to work with several clients in 5 different industries (Life Science/Pharma, CPG, Automotive, Medical Devices and Industrial Products). Each one was an excellent experience to learn from different corporate cultures, people and leadership styles. So I thought I would write down the top 10 leadership lessons learnt from working with some of the best companies in America. Empower people but don’t just let them loose. This may sound like cliché but very difficult to achieve practically especially when you are managing a global team. Leaders empower their people and coach them while holding them accountable. Develop a tracking mechanism to ensure that empowerment is driving positive results and behavior. Raising voice or exercising authority is not persuasion. I was sitting in a workshop where my team was delivering a presentation to our client team. There must have been 20 some people in the room. At a certain point of disagreement, one of the attendees decided to speak at the top of their voice to make sure their viewpoint was accepted. Guess what, people (most of whom worked for that person) ignored him for the remainder of the week. This one is self-explanatory. Don’t be a crybaby. Does this sound like one of your colleagues or a direct report or someone else around you? Some people are full of complaints, dissatisfaction and an opinion on how the world should operate. However when you ask them for a plan or a remedy, they disappear. It is normal to complain but have a recommendation to change the course of things. Think, act and always have a plan. Understand people’s motives. Actions and words are often different from the ulterior motive. Take the time to really listen to people. Make the effort to understand the other person and what they really want. In my line of business this is particularly important, as my client’s needs are often different from what they initially describe. This also applies to people driving their own agenda. Understanding them helps remove certain roadblocks and makes the experience pleasant for everyone. Dynasties change – change accordingly or find a new one. We tend to get comfortable with our colleagues and leaders, and that’s how it should be. But a day comes when people change, and we become uncomfortable. Either embrace the new situation and people, or move on. People often struggle with this as they cling to the glorious past and lose sight of present and future. Make a quick decision, this time for yourself. Be honest to yourself and others. I see good leaders exhibit and practice this trait all the time. It’s like eternal truth. If we cannot be honest to ourselves, we are automatically not being honest to others. It is true that it all comes back around and creates difficult situations that are sometimes career reckoning. Let’s be authentic and keep each other honest. Life isn’t fair.Don’t compete for everything. Identify opportunities where your odds are high. There are many situations that feel like high stakes poker game. You spend a lot of energy and the outcome is as if you played a cheap slot machine. Not fair, right? However, we are the ones who made the decision to begin with. So should one not take risks? Absolutely yes, but become a better judge at understanding what you are getting into. Delegate. You are not a super hero. Do I need to say more? Educate. Prepare. Rehearse. This is a good one. I cannot tell you how many meetings I attend where people are completely unprepared and typically don’t get a second chance to course correct or win their audience. This was common to all companies or clients I worked with. There is only one remedy – over prepare! You don’t have to have all the answers but enough to support your idea. Take care of self and do not forget the loved ones. This should have been number one in the list. First, it’s you, and then, it’s everyone around you who cares for you. Jobs, circumstances, companies, businesses etc. change. The constants in your life are always with you and you need to take care of them. So tell them today how much you love them and thank them for supporting you! Did someone say Supply Chain can’t be “Mobile-cool”? IBM had an ad long time ago where a truck driver gets a call from a dispatch person that he is lost. Driver asks, “How did you know?” Dispatch person goes, “the boxes told me”. The ad was an instant hit. That was the time when RFID was gaining traction and supply chain visibility was a new concept. However the technology was cost prohibitive and even though many large companies like Walmart mandated use of RFID, they had to back down as the industry wasn’t ready. RFID has been fairly successful since then but still remains capital intensive, and not everyone can afford it. At the same time, supply chain landscape has drastically changed in the last 5-6 years. China has been on the rise but other manufacturing economies like Africa, Brazil, Mexico, SE Asia have emerged. 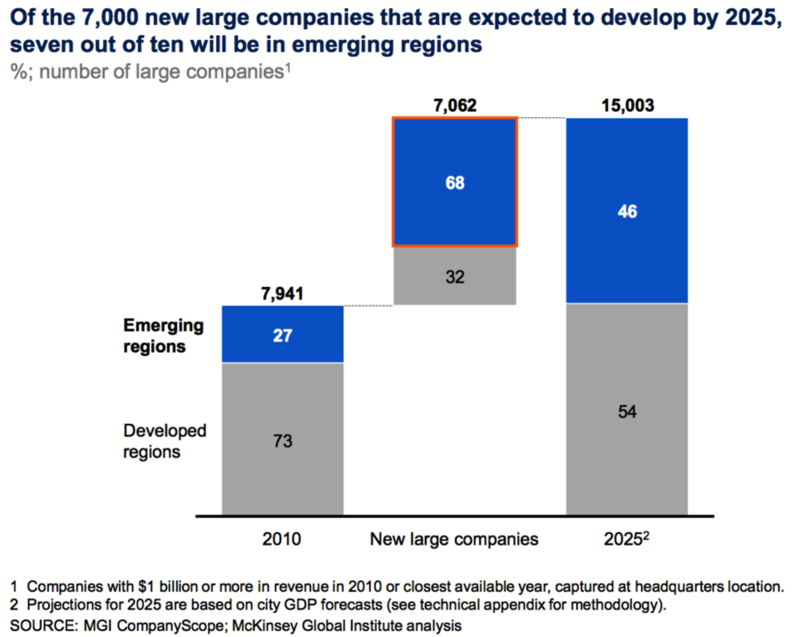 McKinsey Global Institute analysis shows that by 2025, there will be more companies in emerging markets such that global business landscape will be balanced between developed and emerging nations. On the onshore side of things, supplier base has expanded with the emergence of small to mid-sized companies. Once your company was dealing with large corporate suppliers but you now probably have small/medium ones who cannot afford expensive technology like your company does. And, imagine what 3D printing is going to do in the next ten years. Consumer may become the supplier itself! Similarly on the front end, era of consumers is back and customer has more power than ever before, thanks to mobile commerce and social. With so many choices, you are being squeezed both on price and margin. Imagine you are sitting in your S&OP meeting and everyone is looking at price, demand and supply, and talking about the next quarter. Then they all look at you, Supply Chain Executive, and ask a question “How can we cut cost?” Your immediate reaction is, “we are already running so lean. Do you want to drain my blood now?” They all look at you with greedy eyes because you own 40-50% of total cost. You come back to the office, frustrated, call a meeting with your direct reports and ask them to look into every corner to cut cost. At the end of the meeting, the whiteboard in your office has weird drawings and things you have seen in the past – reduce inventory, adjust labor, cut supplier price, reduce transportation cost, re-source material, improve machine turns, and list is so long that it is almost falling off the whiteboard. Continuous improvement, optimization etc. are all best practices and must be done on day-to-day basis. It’s time to go beyond the traditional methods and leverage what the new mobile supply chain has to offer. What if that driver was never lost? You gave him an app that downloads the route you had pre-determined for him, optimized already. You don’t have to invest in GPS or other tracking devices but a simple smartphone. And by the way, driver can notify you if there were any issues so that you can manage customer expectations accordingly. Lastly, you can track actual delivery time to your customers thereby using data to apply analytics to track delivery performance, equipment utilization and customer satisfaction. All begins with one mobile device. An industrial client expects to save $3m in savings over next 3 years with increase in number of trips and freight visibility. Let’s go back to your smaller suppliers who can’t afford expensive supply chain systems but they do have a smartphone today. You have an app for suppliers that allows electronic ordering, forecast sharing, shares production status (or delays), shows delivery scheduling (arrival at your DC). Cool, but one may argue where are the savings? With real time supply and demand sharing, suppliers don’t have to hedge inventory, lower their investment giving them ability to offer better prices. Your DC can correspondingly lower safety stocks. 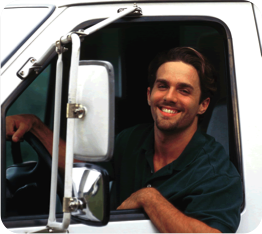 Your DC can plan labor better with visibility of inbound freight and real time updates. The series can go on as you start peeling the onion. A CPG client expects to gain 2 hours of time in daily operations with advanced notification of arrival times, leading to better labor and dock utilization. Client has hundreds of facilities so the savings multiply quickly. Let’s take this within your own network. How much do you spend on industrial devices, their maintenance and corresponding productivity? Take your warehouse, manufacturing and transportation operations and give your people touchscreen devices. In a prototype with a client, we created an app for warehouse operations and tested it with 10 operators. After several field tests and comparing results with traditional devices, almost all operators were 10-12% more efficient. One of the biggest factors was user experience as the operators told us. Industrial engineers had doubts about life of equipment and increase in total cost of ownership over a period of time. Same engineers developed an industrial casing that protects the device and for almost half the cost, and the client got productivity improvement with happier employees. I do have to stop here as there are hundreds of use cases live or in inception stages whereby Mobility is becoming a backbone of supply chain and a new way of managing operating cost. Simplify Warehouse Productivity – 3 First Steps! 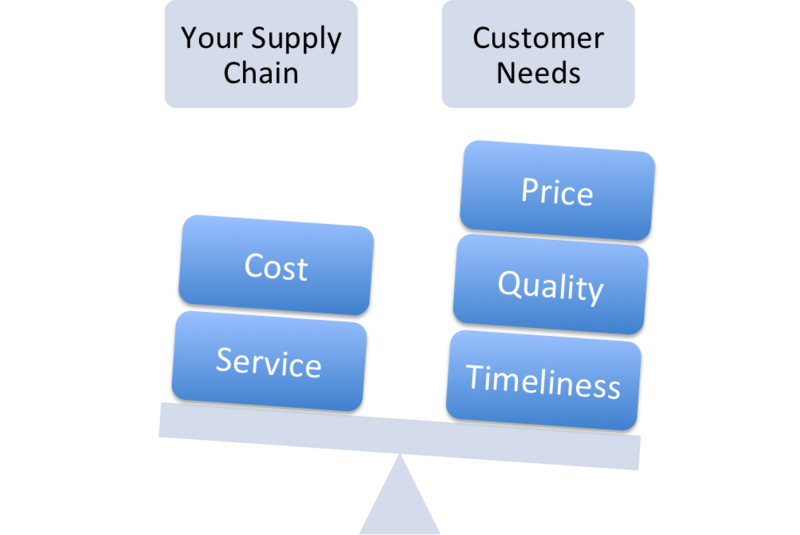 Supply chain pressures are increasing everyday especially as customers want your product faster, cheaper and to their liking. Look at the choices they have – a gazillion e-commerce websites, traditional retail, B2B now entering direct to consumer, and more. Front office is doing everything to keep customers engaged and loyal, and one surefire way is by committing to, and delivering, product as ordered. The onus is thus on Supply Chain Operations to ensure warehouse inventory is accurate, product readily available to pick & ship, and cycle time through the warehouse as short as it can be. This is assuming that the product quality is good and there is a reliable carrier for delivery. Most of the warehouse directors or managers that I work with focus on operations cost, employee productivity and inventory accuracy, and they are measured on these metrics as well. However, one of the key things missing from these metrics or focus areas is the customer! While these supply chain operators would argue that the traditional focus areas are meant for the customers, I would argue, Not Really! So let’s start simplifying things. FIRST, change the focus from how well you can operate well to “how efficiently can you service the customers”. Customers want good quality product for the lowest possible cost with the shortest delivery time. This ought to be the measure or focus for your warehouse operations as well. Again, in a simple fashion, this is how the above parameters become relevant for operations. This is fundamental change management. 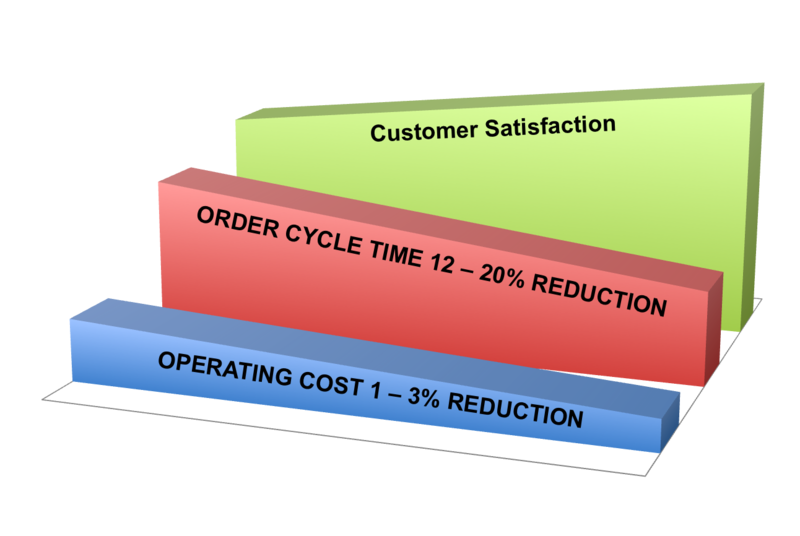 Start aligning your warehouse metrics and the mindset of your operators with the customer value drivers defined above. It may not be easy to change your personal metrics that easily but if you change the operational philosophy, you will see how quickly it would influence the higher-ups. SECOND, work on your biggest lever – Time. To understand this better, let’s clarify a very common notion i.e. “People’s productivity normally implies product is moving faster”. Not true. It depends on how many steps are in the process and if you are measuring individual productivity or the productivity of the entire process. In most operations individual productivity is measured. 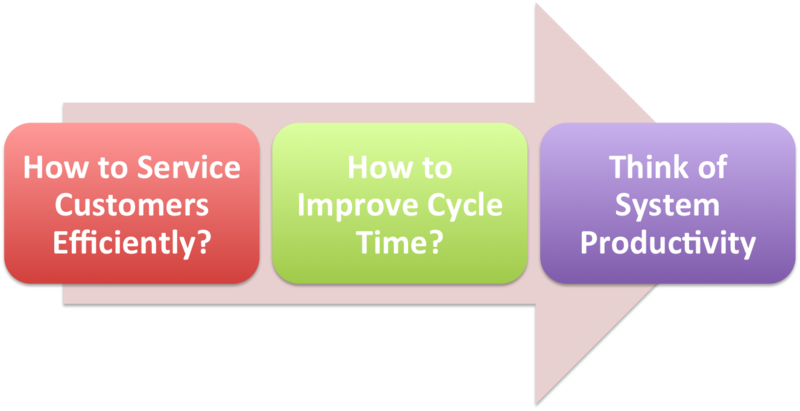 While each of the 4 process steps could be 100% efficient, it does not mean your whole process was productive and cycle time to the customer was low. Look at this example differently. With each of the intermittent delays overall cycle time is 3 hours longer than what most operations would measure. Do you think you serviced the customer efficiently? Only on quality but not on cost and time. Where’s the cost if people were 100% productive? It’s in the inventory sitting on the dock, in multiple trips of warehouse to pick product, and in wait time (if you believe time is money). Time impact is clearly evident, as individual productivity does not necessarily translate into speed of shipping product. THIRD, start thinking in terms of system productivity. Begin with measuring your current cycle time and benchmark it against your own data. What were the factors or conditions for faster vs. longer shipping times? Identify a pattern of most common factors that could be addressed operationally and cycle time will at least become consistent if not start showing improvement. 2) Analyze samples of data from the process studies and look for patterns. E.g. is wait time from planner to picking consistent in fast and slow times? Are packers over loaded? Is high volume causing people to take short cuts and create new bottlenecks? 3) Analyze operational balance in the warehouse. E.g. could receiving dock to stock cycle time be impacting picking cycle time? Why is inventory not in pick location when picker gets there? Are planners releasing the right orders? What are the inputs and outputs of the whole system and constraints? 5) Repeat steps 1 – 3 until you have exhausted operational improvement opportunities. There is a tipping point after which you need additional tools or help. Finally, once you have changed people’s mindset and streamlined your operations as whole, then apply metrics to measure performance, this time differently. You could still keep individual productivity but under the umbrella of total system productivity. There is more to simplifying things in your operations while handling complexity. However, start with the basic steps that are a foundation to larger changes. I will write more about this in coming months. Till then, Happy Simplifying! Note: Above recommendations have been successfully implemented by my clients in Retail, Life Science and Energy industries, who saw a 12-20% reduction in distribution cycle time and 1-3% operating cost reduction in their warehouses.